• General Members can benefit from discount of registration fee. 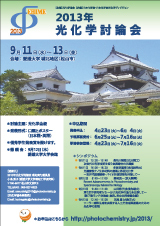 If you are non-member, take this opportunity to become a member of the Japanese Photochemistry Association. • There is no discount on registration fee for student members, but student membership is a must if you wish to make entry to the Best Presentation Award for Students.